I was thinking this morning ..... on my way back from work during the week, I turned on the radio and heard the news of how two men pretending to be blind beggars were arrested by security agents at Imo State University. While I was wondering why anyone will pretend to be blind when thousands of blind men and women are beseeching heaven for a miracle, I recalled a recent article by Pius Adesanmi titled 'APC: The Obstinate Journey to Shame via London. When I read that sentence about democratization of blindness to irony, there was celebration in my cerebral hemisphere, with the immediate effect of throwing me into deep thought. 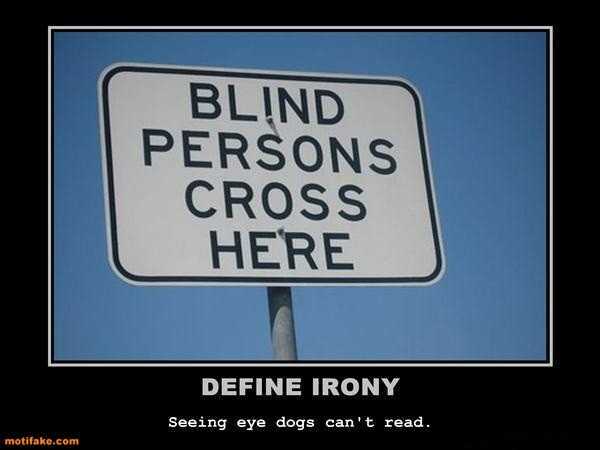 'Am I blind to irony? I asked introspectively. I thought it was only PDP that had confirmed symptoms of 'blindness to irony?' 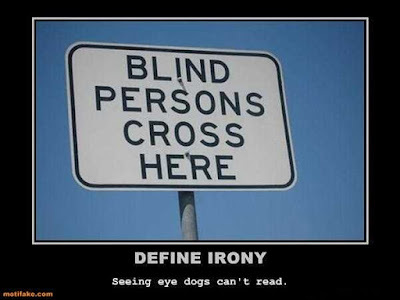 Think about it, how come our political leaders cannot uphold the true tenets of democracy, but can effectively democratize blindness to irony? We must be under a spell! But how is this so? You do not drink alcohol nor subscribe to your friends drinking, yet you took up a job with Nigerian Breweries Limited. It is an irony. If you do not see anything wrong with your position, then you are suffering from 'blindness to irony,' but if by virtue of your position as a manager, you have influenced everyone around you to be so inclined, then you have democratized blindness to irony. Hmm!!! You might be saying 'wetin concern Ogoni man with NEPA light?' Just be patient with me. You say you are watching your weight and decided to eat veggies in the morning, take fresh juice in the afternoon and in the evening, the heap of pounded yam and egusi soup you demolish will be a challenge for 4 regular men to handle. It is an irony. I have no problem if you are hiding to do this, but if you do this openly then you are blind to irony. It's okay if it ends there, but if you have managed to convince your spouse and children to engage in this deception, then you have democratized blindness to irony. Interestingly, blindness to irony did not start today because Matthew 23:16 says 'woe to you, blind guides, who says, 'if anyone swears by the temple, it is nothing, but if anyone swears by the gold of the temple, he is bound by his oath.' To me, it doesn't matter if you are pretending to be blind or you are actually blind to irony, there is nothing honourable about being blind, except of course you are blind to sin. Fela Anikulakpo Kuti of blessed memory had seen all these things far back in Nigeria that he titled one of his hit song BBC - Big Blind Country. There is no honour in blindness in any form be it natural or ironic. It is always a shameful and pathetic condition. Thank God for the change of government that we had. Awolowo was always eulogized at any fora as the best president Nigeria never had. If we had not tested Sai Baba now, we would or they would had nursed this same feeling too as the man that would have perfected our democracy and take governance to eldorado being that his shot as military ruler was aborted abruptly. But God is not man and His ways are not our ways. Buhari and all his philosophies has been exposed. What a Shame!!!! Just imagine if it were PDP government doing all these rubbish, what the likes of Liar Mohammed, Pastor Tunde Bakare of the Save Nigeria Group (Doesn't Nigeria needed to be save now, than ever before) and the rest of them would be saying. Hypocrites!!!! All their heads are buried now in muds but their bodies exposed. Please just purse and IMAGINE. Nigerians are truly wiser now than ever before and are waiting for them in the next ballot. Wetin dem won talk again. How many times dem go fool mumu. Our mumu don dey overflow.